The zip line enthusiasts here at Tree Frog Canopy Tours are nature people, just like you. 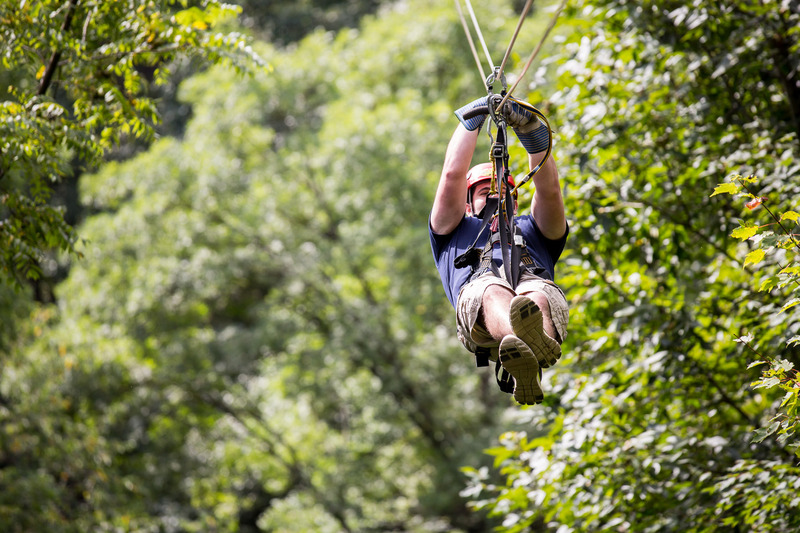 What better place for our zip line canopy tour than over the vast scenery Mohican has to offer? You'll find Tree Frog about nine miles south of Loudonville, Ohio. This is a trip your whole family can enjoy. As you zip line through the trees, you'll also encounter sky bridges and rappels connected to platforms that are suspended in the treetops. We know you're an adventure-seeker, so gear up for Ohio's ONLY dual cable system zip line. We take you higher and faster than you've ever zipped before. We're open rain or shine! Some of our best flights have happened during rain showers. Experience Tree Frog Canopy Tours for yourself all through Spring, Summer, and Fall - we're closed on Tuesdays and Wednesdays in May, September, and October. Check us out on Facebook for awesome updates and specials, or share your own Tree Frog memory! There's never a bad time to prove to yourself, "I can do this!" We've helped thousands of people conquer a fear and become raving fans of this course! Every person will have a guide on their flight to ensure comfort and instruction. Do you have what it takes? We know safety is a concern for you. Each one of Tree Frog's guides and courses strictly follow the Association for Challenge Course Technology (ACCT)'s standards. We test our courses every morning before we open.